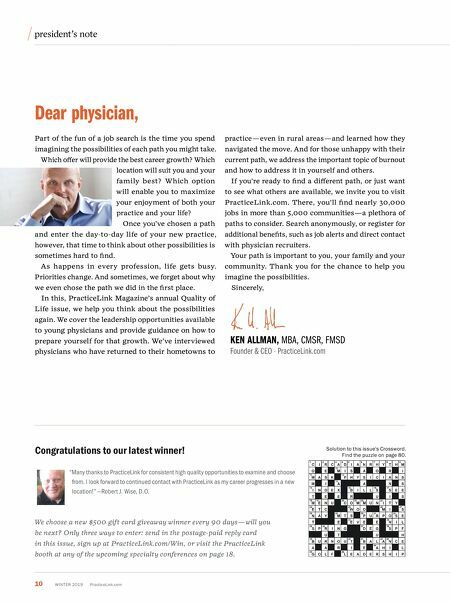 10 W INTER 2019 PracticeLink.com president's note Dear physician, Part of the fun of a job search is the time you spend imagining the possibilities of each path you might take. Which offer will provide the best career growth? Which location will suit you and your family best? W hich option will enable you to maximize your enjoyment of both your practice and your life? Once you've chosen a path and enter the day-to-day life of your new practice, however, that time to think about other possibilities is sometimes hard to find. As happens in every profession, life gets busy. Priorities change. And sometimes, we forget about why we even chose the path we did in the first place. In this, PracticeLink Magazine's annual Quality of Life issue, we help you think about the possibilities again. We cover the leadership opportunities available to young physicians and provide guidance on how to prepare yourself for that growth. We've interviewed physicians who have returned to their hometowns to practice — even in rural areas — and learned how they navigated the move. And for those unhappy with their current path, we address the important topic of burnout and how to address it in yourself and others. If you're ready to find a different path, or just want to see what others are available, we invite you to visit PracticeLink.com. There, you'll find nearly 30,000 jobs in more than 5,000 communities — a plethora of paths to consider. Search anonymously, or register for additional benefits, such as job alerts and direct contact with physician recruiters. Your path is important to you, your family and your community. Thank you for the chance to help you imagine the possibilities. Sincerely, Congratulations to our latest winner! K e N all M a N, MBA, CMSR, FMSD Founder & CEO · PracticeLink.com Solution to this issue's Crossword. 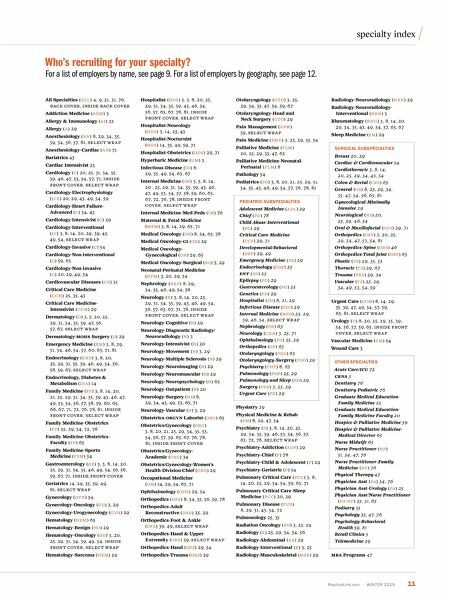 Find the puzzle on page 80. "Many thanks to PracticeLink for consistent high quality opportunities to examine and choose from. I look forward to continued contact with PracticeLink as my career progresses in a new location!" —Robert J. Wise, D.O. We choose a new $500 gift card giveaway winner every 90 days — will you be next? Only three ways to enter: send in the postage-paid reply card in this issue, sign up at PracticeLink.com/Win, or visit the PracticeLink booth at any of the upcoming specialty conferences on page 18.